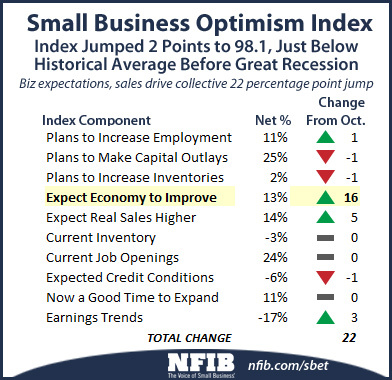 Each month, the The NFIB (National Federation of Independent Businesses) Research Foundation has published the Small Business Optimism Index—a measure of how small business owners feel about current business conditions and the outlook for the upcoming six months. The index rose two points to 98.1 in the December report (based on a November, 2014 survey of independent small business owners conducted before the bulk of holiday shopping was done), which placed it at its highest level since February of 2007, before the recent “Great Recession” began. This is just above its overall historical average of 98 (from 1974 through the present, which includes “Great Recession” data). The index is comprised of ten components: plans to increase employment, plans for capital outlays, plans for increasing inventory, expectations for economic improvement, expectation for higher retail sales, current inventory, current job openings, expected job openings, whether it is a good time to expand, and earnings trends. The 2 point increase in the index was almost entirely driven by two forward-looking components: Expectations for Business Conditions in the upcoming Six Months and Expectations for Real Sales Volumes. The first of these contributed 16 points to the index, with a net 13% (those answering better – those answering worse) of those surveyed reporting being optimistic about improvement. This value was -3% in the previous month, and -20% a year ago. Unfortunately, these newly optimistic expectations are tempered by a less than optimal current business reality. Small business owners are still facing significant operational issues, with four index components adding a cumulative -1% to the index: job creation plans, plans for capital outlays, job openings and inventory investment plans. The causes of current small business problems are varied, but taxes and government requirements and red tape were cited by business owners as the most important problems, followed by poor sales and the quality of labor. Based on the fact that the top two problems are government related, and that a lower percentage of respondents cited the “political climate” as a reason not to expand, the study commentary postulates that the increased optimism was caused by the recent elections, and that small business owners expect to see improvement when the new congress takes office in 2015. We’ll have to wait and see on that one. But there are many economic indicators that provide reason for optimism in 2015. Inflation is still historically low, oil prices are plunging, interest rates are holding low and steady (though that may not last), and US GDP growth is at an 11 year high. 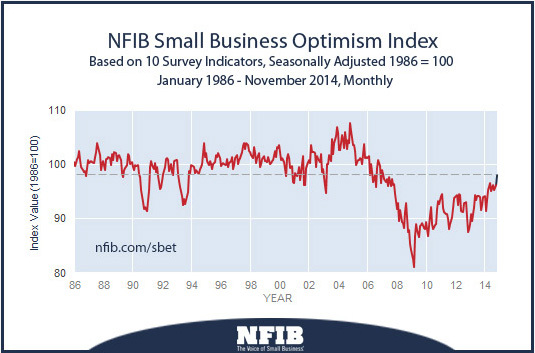 How do your concerns mesh with those reported in The Small Business Optimism Index? Download the full report and find out. Image Credits: NFIB SMALL BUSINESS ECONOMIC TRENDS, December 2014. © NFIB Research Foundation. ISBS #0940791-24-2.